An A&E department serving 120,000 people will "temporarily" close because of patient safety and staff shortages, the NHS has said. 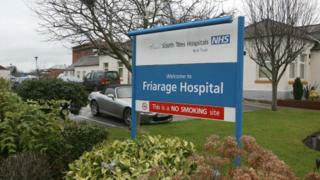 Critical care at Northallerton's Friarage Hospital will be suspended from 27 March. The leader of Hambleton District Council said the eventual permanent closure of the hospital's A&E unit felt "inevitable". But the hospital said the vast majority of services will be unchanged. In 2014, Friarage Hospital stopped providing overnight children's care and only women deemed low risk could give birth at the hospital. Dr Adrian Clements, of Friarage Hospital and South Tees Hospitals NHS Foundation Trust, said the hospital tried and failed to recruit for "gaps in the workforce" for the last two years. He said: "We need to make urgent temporary changes to our services to ensure we continue to provide safe clinical services and to mitigate the increasing risk of an emergency evacuation of the site on patient safety grounds." The NHS Trust said the critical care department at the rural hospital needs four consultants to be safe, but is currently staffed by one 67-year-old. Two consultants, rather than eight, cover critical care out of hours. The Trust said once the changes are in place, a public consultation will begin on the hospital's long-term future. Mark Robson, of Hambleton Council, said the NHS assured him it was "not the thin end of the wedge", but said permanent closure feels an inevitable "fait accompli".